When Moses was nearing the end of his life, he gathered the people of Israel, so he could prepare them to cross the Jordan River and take possession of the Promised Land. Even though Moses wouldn’t cross over with them he wanted them to know that God would be with them (Deut. 1:1-8). Now it was Moses’s successor, Joshua, who was nearing the end of his life. Like Moses he gathered the people of Israel to prepare them for a new future without his leadership. Again, the message is God is faithful and God will be with you as you move into that new future. He does this by retelling the story of Israel. He begins with Abraham and takes the people on a journey through time. Joshua reminds the people how God led Abraham to Canaan from the land beyond the Euphrates, making a covenant with the promise of many descendants. We hear again the stories of Isaac, Jacob, and Esau, as well as the sojourn in Egypt that leads to the call of Moses and Aaron, who led the people out of slavery through the wilderness to the river Jordan. That’s where Moses passed the mantle of leadership to Joshua, who led the people across the river into the Promised Land. Joshua’s message was simple: All along the way, God was with Israel. It was God who gave Israel the land and handed them victory over their enemies. Yes, the word of the Lord is: “I gave you a land on which you had not labored, and towns that you had not built, and you live in them; you eat the fruit of vineyards and oliveyards that you did not plant” (Josh. 24:13). After retelling this story, Joshua asks the people: who will you serve? Will you serve the God who led you through the wilderness and across the river into the land of promise, or will you serve other gods, like Abraham and his family did before God called him and made a covenant with him? There are always other gods, who attempt to lead us away from God’s vision for humanity. The choice is ours. Will we give our allegiance to the God who remains faithful through thick and thin? Although this is a very powerful story, it’s not without its difficulties. You see this is not only the story of God’s faithfulness. It’s the story of conquest. Although Joshua acknowledges the presence of other peoples in the Land, they are quickly vanquished as Israel takes possession of the Land. It’s a vision that undergirds the Doctrine of Discovery that encouraged our ancestors to conquer the New World, a process that decimated the native peoples of the American continents. At the last General Assembly we passed a resolution that called on us to repent for these actions of our ancestors. It’s not just feeling sorry about the past. It speaks to the way we live in the present, acknowledging the full humanity of our neighbors and the sacredness of God’s creation. We need to acknowledge these truths, even as we affirm God’s faithfulness to the Covenant promise made to Abraham. God formed a people and has walked with them through time. God was with them in Egypt and in the Wilderness. God would with them in the Promised Land. God was with them during the Exile and in the centuries to follow. If God is faithful to God’s promises, then to whom do we owe our allegiance. Whom will we serve? We hear this word from Joshua as we enter the season of Stewardship. 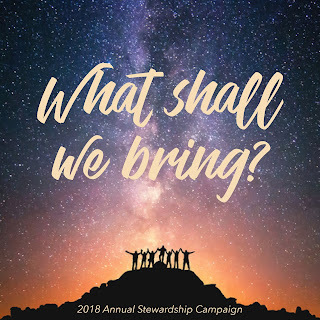 You may have already received your stewardship packets or you will receive them today. My job this morning is to encourage you to consider prayerfully what God would have you give financially during the coming year. The moneys we give, along with our time and our talents, help sustain the ministry of this church. This past week many of us gave our time and talents and maybe some money as we co-hosted SOS at CCB. We’ve been doing this for more than twenty years in partnership with CCB, and more recently with Northminster Presbyterian. It’s one of those “all hands on deck” experiences, and I appreciate all the work that goes into it. I participated in a variety of ways, but some of you gave a lot more of your time and your talents than I did. So thank you for your service to God and neighbor. You won’t find any mention of making financial pledges in Joshua 24. Joshua doesn’t speak of being a cheerful giver or even an uncheerful one, he simply asks: whom will you serve? This question does have stewardship implications. If we believe in the ministry of this congregation, then we will find ways of investing in it. 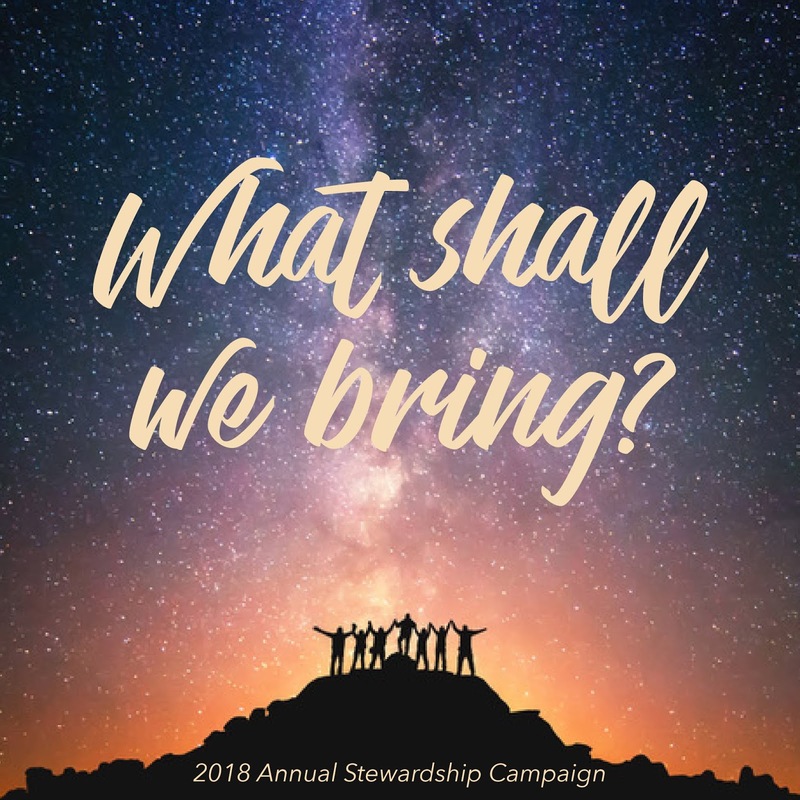 That’s because stewardship in all its dimensions, including financial giving, is an expression of our commitment to serving the God who has called us in Christ to serve in this place. Joshua doesn’t take up a collection, but he reminds the people of God’s faithfulness. When Joshua speaks on God’s behalf, he makes a lot of “I” statements. He tells the people: “I took your father Abraham . . . and led him through all the land of Canaan and made his offspring many.” “I gave him Isaac.” “I gave Jacob and Esau.” “I sent Moses and Aaron.” “I brought your ancestors out of Egypt.” And on it goes, until in verse 13, God reminds the people that the Land they now possessed was also a gift. So how do you respond to God’s gifts? 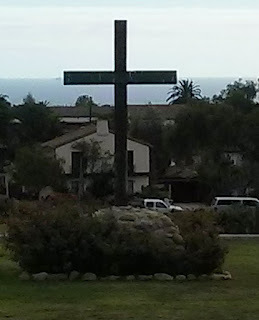 As I pondered the biblical story, I thought about our congregation’s story. The question is, where do we start? Do we start in 1979 when we entered this building? Or should we go back much further, perhaps to Pentecost or the Reformation or to Barton Stone and the Cane Ridge Revival of 1801? What about 1809 when Thomas Campbell issued his Declaration and Address? Or 1832 when the Stoneites and the Campbellites merged their work? We could start in 1841 when the Hawley family arrived in Detroit and gathered like-minded people in their home, which led to a more permanent congregation in 1842. Then there’s the arrival of Isaac Errett in 1863, who planted a congregation on Jefferson Avenue. Isaac Errett’s story is an interesting one. Not only did he plant a number of Disciples churches in Michigan, but he also caused a ruckus in Disciples circles when, during his brief tenure in Detroit, he became the first Disciple to use the title Reverend for himself. He also caused a stir in our movement when he published a statement of faith that came to be known as “Our Position” while serving the Jefferson Avenue church. We could speak of the establishment of Central Christian Church on Washington Avenue in 1871 or the move in 1891 into the new building at Second Avenue and Ledyard on Cass Park. Of course, we can’t forget the establishment of Woodward Avenue Christian Church in 1903, because these two congregations, along with several others, merged in 1926 to form Central Woodward Christian Church. We might want to think of the arrival of Edgar Dewitt Jones in 1920 to establish a great church so that the Disciples’ message of Christian Unity could be heard and received in the fast-growing city of Detroit. That led to the building of a great neo-gothic building on the former site of the Woodward Avenue Church in 1928. We would be in that space until the late 1970s, when the church moved to Troy, under the leadership of Bob Boyte. There was a brief time when we were between buildings, but we’ve been in this space since 1979, ministering to our community. I might add in my own arrival in 2008, because I felt called by God to share in the ministry of Central Woodward. Like Joshua, I’ve given a quick tour of our history. I know that there are many other stories we could tell. Many of you can tell them better than me. I’d like to point out a few upcoming anniversaries. First of all, it’s been ninety years this month that the congregation dedicated the “Old Church” on Woodward Avenue. Next year we’ll observe our fortieth anniversary of living together in this space, along with the tenth anniversary of the burning of our mortgage. Then in 2020, we’ll celebrate the centennial of Edgar DeWitt Jones’ arrival in Detroit, which set in motion much of what has transpired over the past century. Having heard these stories of God’s faithfulness, where do you see God at work? As you consider this question, think about SOS, Rippling Hope, the Perry Gresham Lectures, and our Iftar dinners with the Turkish American Society. Think about our decision to become “open and affirming?” I know that this was a difficult journey, but it has been a blessing to a number of people who were looking for a safe place to worship and serve. So where is God leading us next as we cross the river into the future? So who are you going to serve, because as Bob Dylan once sang: “it may be the devil or it may be the Lord, but you’re gonna have to serve somebody.” Joining with Joshua, “as for me and my household, we will serve the Lord.” Making that claim has stewardship implications.